breflex | Reflect and act….. This entry was posted in Uncategorized on September 18, 2014 by breflex. Open Learning: New for Old? In the connected, participatory, constructivist, collaborative and mobile learning world of social media, to what extent does this definition still have merit today? • how they learn – methods, media, routes – multiple methods, media and route ways now exist but can too much of these be a possible barrier to learning i.e. Neophyte learners being lost in hyperspace without the appropriate structures to guide their agency? It’s interesting that the current connected course has a time lined curriculum structure – in a truly open course should we start with a blank space and negotiate what we want to learn or would that be chaos and logistically impossible? • where they learn (place) – endless mobility of course has its attractions – what’s not to like? • how quickly they learn (pace); different learners learn at a different pace but should courses be time constrained especially with regard to meeting assessment deadlines? media reports and research – ‘the teacher persists’ in the MOOC, and finds that the MOOC teacher is often required to perform multiple roles: lecturer, designer, mentor, institutional marketer, etc. in a highly visible and therefore highly risky environment. • whether, when and where to have their learning assessed – yes the great connectivist challenge! Assessment as ongoing formative feedback and conversation/dialogue or assessment as summative accounting/auditing/warranting….the debate continues….. This entry was posted in Uncategorized on September 7, 2014 by breflex. 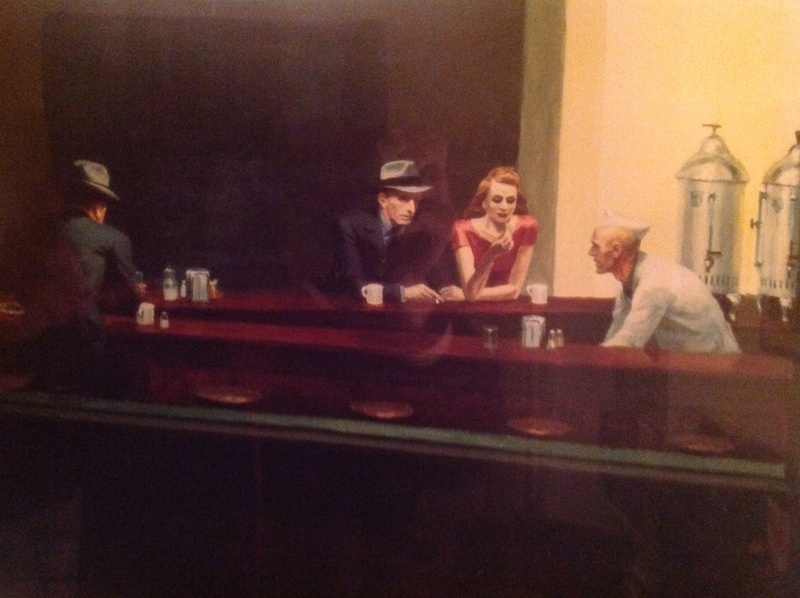 This then led my wandering mind to Nighthawks by Edward Hopper ……”odd hours” indeed…..and hence my course header….. This entry was posted in Uncategorized on September 2, 2014 by breflex. I’m writing this from Bellows Falls in Vermont, USA. I’m on vacation or am I in this new ‘here and now’ combination of leisure, learning and working experiences – open and closed, connected and disconnected at the same time as I self edit my relationship between the multiplicity of options that the the digital and real world presents at this current time. In fact earlier today I went physically to the newly restored Bartonsville Bridge and after watched the original bridges demise digitally – washed away as a result of Hurricane Irene. That’s my first shared connection….. I look forward to meeting, and sharing with you all in the future. This entry was posted in Uncategorized on August 28, 2014 by breflex.